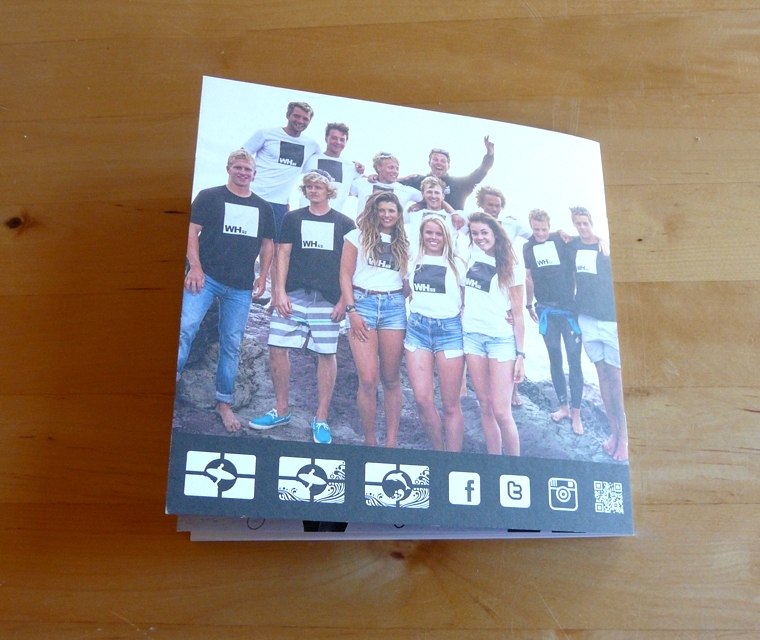 This is the 2016 Brochure we designed for Wavehunters highlighting their sea safaris, boat trips, water taxi, boat charter, surf school, paddle boarding and their brand new Padstow shop. 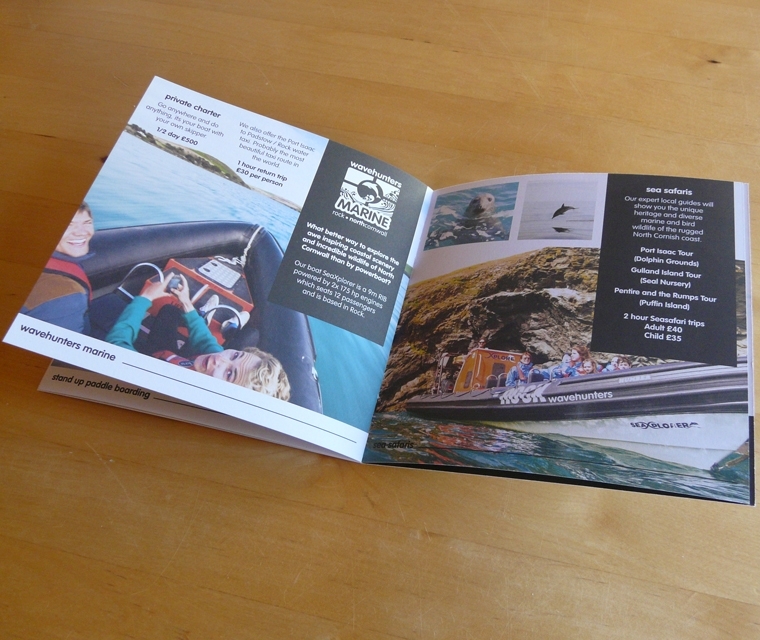 We designed a wrap so that the brochures could be placed in the John Bray holiday accommodation and match both brands. The wrap fits neatly over the brochure, revealing a little of what lies beneath. With 4 locations we hand illustrated a map to show what goes on where. We also drew some of the coastal sites people can expect to see on their boat trips. The format we went for used the square space to full advantage. The chunky font stands out well with the monochrome colours and the vibrant photography helps tell the story. In 2015 we designed a premium 12 page brochure for Wavehunters to further advertise their services, printed on uncoated stock. Each page has bright coloured images and minimal text on recycled stock. The brochure also features the new Marine services the company offers. Finished off with a team photo! The brochure is square and a handy size for hotels and business to put out for potential customers. 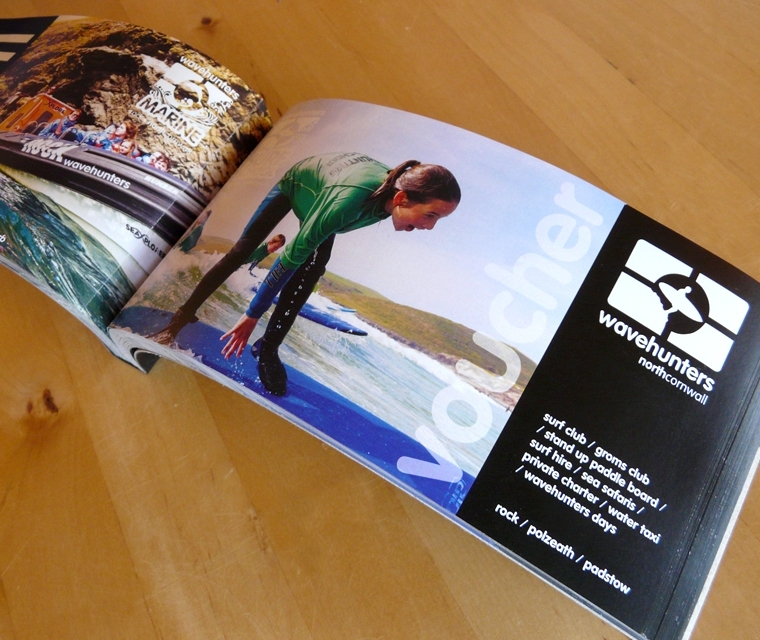 We designed a voucher book for Wavehunters for both Surf and Marine sides of their business. It adds value to gift vouchers purchased. The vouchers are perforated so can be torn from the book and have an area for writing information on. 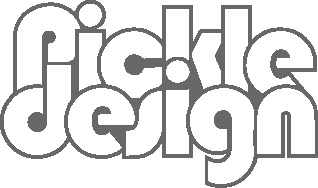 Slightly out of the box – we were asked to design a colouring and activity sheet for kids. We had a great time illustrating things the children might spot by the sea, creating a word search and drawing sea scenes to colour in. These sheets were A4 and came in a pad so could be torn off when needed.